I NEED YOUR HELP! 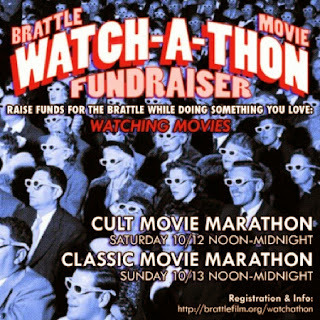 Fund The Brattle and Send Me To The 2013 Watch-A-Thon! Two weeks from today the Brattle is staging their Watch-A-Thon, a two day marathon of 24 cult and classic movies, as a fundraiser to keep this wonderful theater up and running and showing all kinds of totally awesome flicks well into the future. I really want to attend and watch as many movies as possible, but in order to do that, I'm gonna need your help. As you're no doubt aware, I'm currently a little more than halfway through my year-long effort to watch a movie I've never seen each and every day. Suffice it to say that I've spent quite a bit of time (and money) at different theaters all over Boston in my daily cinematic quest and it's given me a great new appreciation for the Brattle specifically. They've given me the opportunity to not only catch some stellar indie and underground films like Cheap Thrills, I Declare War and A Band Called Death, but also to see some fantastic classics like Enter The Dragon, 12 Angry Men and Foxy Brown the way they were always meant to be seen. And let's not forget about all the cool events they've held like the Boston Underground Film Festival or the recent Cornetto Trilogy Triple Feature Pub Crawl with Edgar Wright, Simon Pegg and Nick Frost in attendance. I absolutely live for this stuff and I'm constantly grateful that I live in a place with a moviehouse that goes above and beyond to deliver the best cinematic experience possible. The Brattle has been very kind to me these past seven months and I'd love to return the favor. In order to participate I need to raise $240, which really isn't a crazy amount. I'm hoping to surpass that goal, especially because there are prizes for the biggest fundraisers. But I don't have a lot of time left, so I'm trying to really get this thing into gear before it's too late. You can either donate flat amount or you can pledge per each film that I watch. (I can tell you that I plan to attend both days but probably won't watch every movie, just most of them.) And hey, the list of films screening is right here, so if any of them strike your fancy then there are individual tickets available. Come along and I'll save you a seat! Please click here to donate to my campaign. Even if it's just a small amount, (I think the lowest possible donation is $10) it'll all add up in the end and every little bit helps. And pass it on! PS - I'm planning on having a big final screening/birthday party at the end of February and I'm really hoping I'll be able to hold it at the Brattle. Raising them a bunch of money certainly can't hurt my chances. So for those of you in Boston, think of this as an investment in an awesome future party.